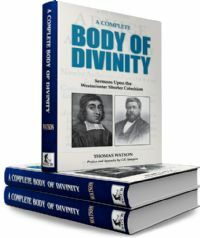 In 1878 Charles H. Spurgeon wrote a Preface to his publication of a new revised edition of Watson's 'Body of Divinity', which he introduced with these words: "Thomas Watson's BODY OF PRACTICAL DIVINITY is one of the most precious and peerless works of the Puritans; and those best acquainted with it prize it most. Watson was one of the most concise, racy, illustrative, and suggestive of those eminent divines who made the Puritan age the Augustan period of evangelical literature. There is a happy union of sound doctrine, heart-searching experience and practical wisdom throughout all his works, and his BODY OF DIVINITY is, beyond all the rest, useful to the student and the minister." Spurgeon later informs us that the primary purpose of the new edition of this classic work was for the benefit of the students in The Pastor's College. He then tells us that Rev. George Rogers, principal of the Pastor's College, carefully superintended the issue of this edition, and in a note written to Spurgeon said: "I know of no work with so much sermon matter within the same compass. In Howe, and Charnock, and Owen, we must often read much before we are tempted to close the book and think out a whole sermon, but Watson teaches us to make short work of it. The whole may be utilized. On this account it would be, I think, of great value to all our students who have pastorates. It is for their benefit, I suppose, you wished the reprint. All editions extant which we have seen, abound in errors and imperfections. These have been rectified, not entirely we fear, but in a degree as nearly approaching to accuracy as in a revision of another's composition could be expected. No alteration of sentiment has been made, but every shade of the author's meaning has been scrupulously retained." A unique feature of this edition is the inclusion of Spurgeon's APPENDIX ON BAPTISM which is placed at the end of the Watson's work. Spurgeon explained the reason for the Appendix in the closing words of his Preface: "As it would be most uncandid to suppress any part of an author's opinion, the chapter on Infant Baptism remains as it came from his pen; but our conscience could not allow us to issue it without inserting a statement of our own views as an Appendix. We trust this method will commend itself to all; we knew not what fairer and more honest course to pursue." This is the COMPLETE Body of Divinity by Watson as it covers all the material in the Shorter Catechism. In more recent times Banner of Truth has published his work and entitled his exposition of the first 38 questions of the catechism The Body of Divinity, and then his two other sections have been published under the titles The Ten Commandments and The Lord's Prayer. This one volume contains the complete contents of all three of those volumes and puts them conveniently in one book. THOMAS WATSON (1620-1686) graduated from Emmanuel College, Cambridge, where he was known for being a hard student.á He was a man of considerable learning, a popular but judicious preacher, and eminent in the gift of prayer.á He is one of the most popular of all the English Puritans and, certainly one of the most readable.á While the volume republished here was his most popular work he also wrote several others that have been reprinted time and time again, such as, Heaven Taken by Storm, The Godly Man's Picture, The Beatitudes, All Things for Good and The Doctrine of Repentance.